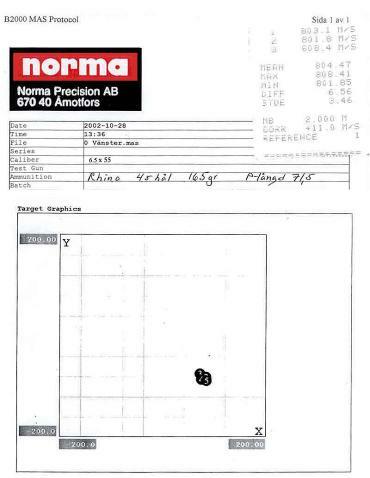 We are proud to announce that Norma has loaded 25000 .270/150gr. And 25000 243/100gr. The 270150gr. went to France for testing and the 243/100gr. To Scotland . Feedback to date is that both cartridges are shooting exceedingly well. I received a telephone call from a friend, Roy Herselman, on a Saturday night in March, 2001. Roy informed me that he was interested in a 400 grain .375 caliber bullets and also wanted to know whether Kobus van der Westhuizen of Rhino bullets would be willing to develop such a bullet. We talked at length about the feasibility of such a heavy bullet. In the end I suggested a 380 grain / 375 bullet and told Roy that I will contact Kobus and will let Roy know about the outcome of the discussion. In my discussions with Kobus, we decided to use the 350 l 375 Rhino bullet as a departure point in the making of the 380 grain 375 bullet. I received the first 380 grain bullets early in April and proceeded with the testing of the bullet in a wet pack combination with a duplex load of 32 grains of S 335 and 32 grains of S 365 and a Magnum primer in a Winchester Case in my Custom BRNO .375 H & H Rifle. The duplex load gave us a 20mm. group and proved to be most accurate Please note the above loads can only be used on Winchester and Norma cases. In a PMP case you can use 31 gr. S335 and 31 gr. S365 Duplex with a magnum primer. You can also use 64gr S365 with a magnum primer. S.A.B.S. test with S365 gave us 47472 PSI. and a velocity of 2200 ft/sec. 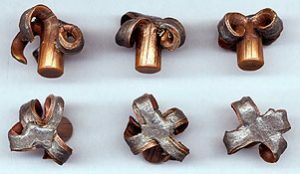 The bullets proved to be strongly constructed and penetrated two meters of wet and dry packs. Within a week I had a second generation 380 grain bullet to test. These bullets expanded very well in the wet l dry pack test medium. Kobus experienced the same test results in his tests with dry / wet pack tests. 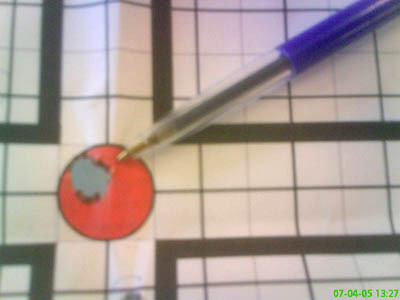 Above all I managed to get incredible groupings with this bullet in my rifle. 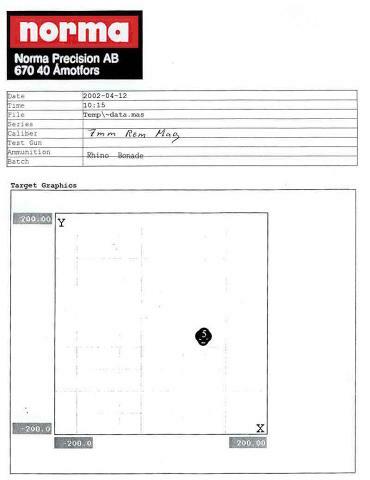 In fact many groups (3 shot) were well below 20 mm. Velocity in my rifle with the duplex load was on average 2220 feet per second. I then contacted Koos Barnard of Magnum magazine who agreed to become part of the team in terms of testing the bullet. The full report appeared in the June 2001 edition of Magnum magazine. Together we went through 7 generations of the 380 grain bullet in 4 weeks. Initially it appeared that the bullet was too long because it deflected on a gemsbok Koos shot with this bullet and also because the third generation bullet had a slightly bent shank when the bullet was removed from the Gems buck. In the later generation bullets, The mouth of the bullets was enlarged because I felt that this bullet needed to expand quite rapidly upon impact with an animal. The wall thickness of the bullet was also reduced which in conjunction with the larger mouth promoted the expansion of the bullet and also reducing the chances of the bullet deflecting or tumbling within the animal.At this stage we all felt that the bullet was ready to be used in the African hunting fields. Jaco du Plessis of Pretoria shot the first buffalo bull with this bullet in Zimbabwe with the mentioned duplex load. 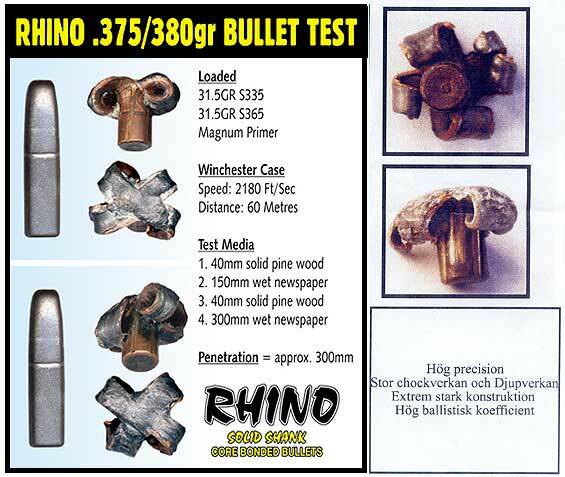 As far as we know over a 100 buffalo were shot with the 380 / 375 Rhino bullet in 2001. 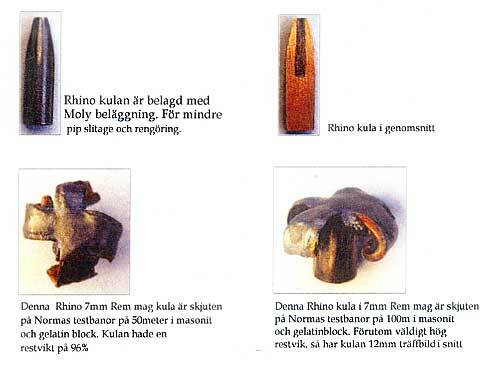 This bullet was also used with great success on animals like eland, blue-wildebeest, zebra etc. Early in year 2002 Kobus and I had a discussion and decided that as the 380gr was being used to a large extent on Buffalo. That it would do no harm to strengthen the bullet further but at the same time try to keep most of the characteristics which had made the bullet so successful in the year 2001 We decided to thicken the walls by .05mm and to groove the inside of the bullet to help the thicker walls to open easily and pushed the bottom of the drill holes round with a grooving punch. Based upon my conversations with professional hunters and local hunters in South Africa we do know that many old buffalo bulls have also succumbed to the 380 grain 375 Rhino bullet in 2002 in Zimbabwe, Tanzania and Botswana. All the hunters who have used this bullet agree that the Rhino 380 I 375 bullet has changed the venerable 375 H & H Magnum into an extremely efficient all round cartridge for all types of game especially in Africa. As can been seen from the above tests done by Norma the bullets fame has traveled very far in less than 2 years. Kobus and I would like to thank everybody who had a helping hand in the development of this bullet. We both believe that this bullet will be a great hit in the Northern Hemisphere on Moose and Bear as can be seen from results we have received from Africa where this bullet has been used with great success on our larger soft skin animals like Kudu – Blue Wildebeest and Eland. 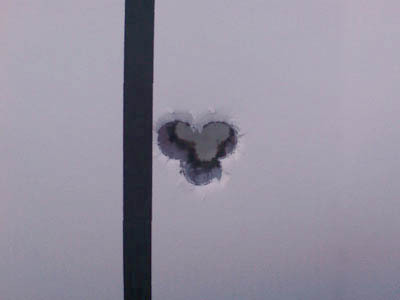 The following heads show the excellent results when shot into various media. Recovered from Blue Wildebeest shot by American hunter.Middle: Shot into wet pack. Right: Shot into water test tank at 5 metes.